Whether the Carnival fills you with fuzzy nostalgia or paralyzing fear, it’s indisputable that Roger Vail has created some beautiful images. 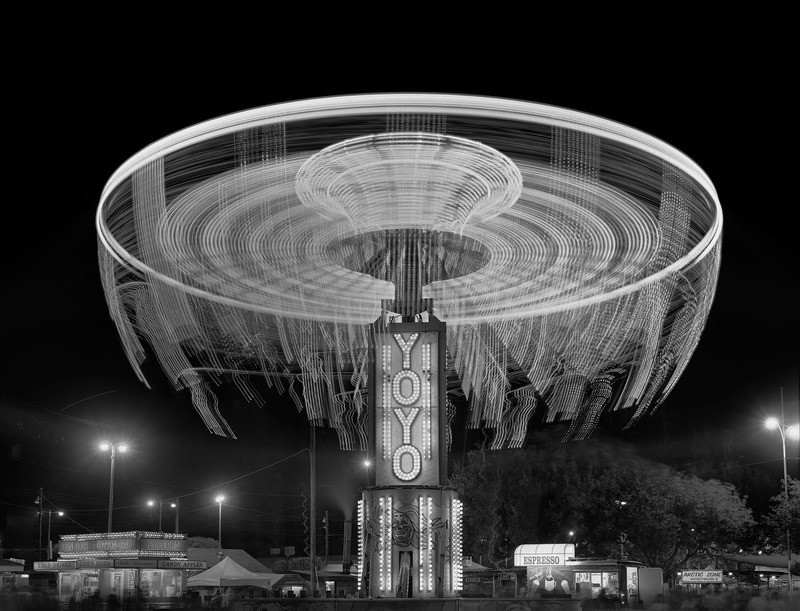 In 1970, Roger Vail began photographing carnivals and their thrill rides with his 8 x 10 inch view camera. His pictures were made in the evening hours with long exposure times, resulting in images that track the momentum of the ride with a sense wonderment that is both tangible and otherworldly. Carnival will feature Vail’s extraordinary, large-scale photographs of carnival rides in full motion; tracing the kaleidoscopic light play seen only through the extended moment that photography permits. In addition to the large-scale color and black and white images, his smaller, more intimate platinum/palladium prints will be featured in the atrium gallery. Roger Vail earned his BFA and MFA degrees from the Art Institute of Chicago. His photographs are in the collection of numerous institutions, including: Art Institute of Chicago, Museum of Contemporary Photography, Nelson-Atkins Museum of Art, Museum of Modern Art, San Francisco Museum of Modern Art, and the Princeton University Art Museum. The exhibit is now open and available for viewing until August 22nd.